Wick, 19th September 2017 – Class-leading Offshore Energy Support Vessel (OESV) operator Seacat Services has secured a contract with Beatrice Offshore Windfarm Limited (BOWL) to support the construction of Scotland’s second major offshore wind farm. The contract comprises a 730-day logistical support charter for 26-metre catamaran, Seacat Intrepid, commencing on September 25th this year. 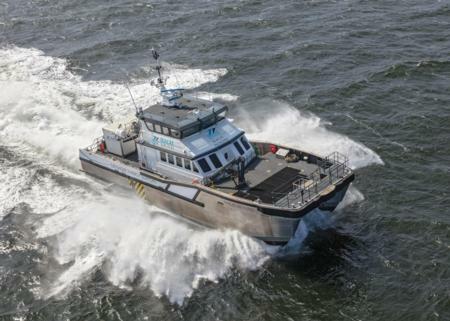 Intrepid will be joined by sister vessel, Seacat Courageous early next year. BOWL is owned by SSE (40%), Copenhagen Infrastructure Partners (CIP) (35%) and Red Rock Power Limited (25%). Under development in the Outer Moray Firth in the north of Scotland, the wind farm will produce 588MW of power. It will receive onshore support from the new Operations and Maintenance (O&M) hub at the Port of Wick, currently undergoing construction. With considerable planned investment and opportunities in the Scottish offshore wind sector, the industry is seeking to maximise the benefit of lessons learnt and transferrable knowledge accrued in the wider UK and European markets. As the first deep-water utility-scale projects start to be brought online in challenging waters off the Scottish coast, assembling an experienced project team is a key focus for asset developers and owners. Having previously established a long-term relationship with project stakeholder SSE at the Greater Gabbard wind farm off the coast of East Anglia, and with vessels under contract supporting construction and O&M activity at project sites throughout UK, German and Danish waters, Seacat Services is well-placed to support BOWL throughout the time and resource-intensive construction phase. In practical terms, at 26 metres, Seacat Intrepid and Seacat Courageous are at the larger end of the OESV scale, providing them with high capability, without compromising on manoeuvrability and responsiveness. Both vessels benefit from extensive fuel and cargo-carrying capacity, and operate at a service speed of up to 26 knots. The proven versatility and reliability of these vessels will be essential in driving the efficiency of crew and equipment transfers, while the technicians’ familiarity with the vessels will ensure their safety and enable them to complete their jobs to the best of their ability. More broadly, the deal between Seacat Services and BOWL provides further evidence of the strength of support delivered by the UK maritime supply chain to offshore wind developers and operators.